Dressing up in various costumes for Halloween is a huge part of the holiday fun, so for this card, I decided to take my inspiration exactly from that. Witches never go out of fashion and there are so many styles to choose from too - good witches, bad witches, classic witches, modern witches, etc., so I couldn’t miss a chance to create another bewitching card, could I? If you asked people, what colour they associate with witches, it would probably be black, for me, however, it is green and purple. I wonder, if my choice was subliminally influenced by the “Hocus Pocus” movie, hmmm. For this project, I decided to use a paper collection by Echo Park, called “Happy Halloween”. The colours in this set are really fun and vibrant, so picking the designs I liked wasn’t hard at all. I chose four different patterns, which complemented each other thematically and colour-wise. Once I decided on the layout I wanted to use for the card, I cut the papers to the size needed and matted them on “Black Cat” Core’dinations cardstock. Black matting works really well for Halloween cards, as it not only suits the occasion perfectly, but helps those patterns stand out better against each other. I also attached some lilac sheer organza polka dot ribbon to the spiderweb paper strip. Polka dots tend to create a fun and carefree tone to the project, which I liked. While this section of the instructions is called “stamping”, the image I chose to be the focal point of this card is not a stamp per se. This fun witch is a digital image, created by Annie Rodrigue and comes in a colouring stack (exclusive to 7 Kids Craft Store), which is a set of printed images ready for you to colour. I thought I’ll take the colouring stack a little further than just treat it as a colouring book and actually use the images on my cards. I coloured the witch using Promarker, Brushmarker and Copic alcohol based markers and fussy cut her out, leaving a narrow white outline around the image. The dominant colours I chose for this project are green and purple, however, I made sure to include patterned paper with some warmer tones to give the card a cosier feel. I wanted to pick up these warmer colours in my background as well. I blended Tim Holtz Distress Inks in “Rusty Hinge”, “Spiced Marmalade”, “Mustard Seed” and “Crushed Olive” to create a gradient effect. I then sprinkled the inked area with water and gold acrylic paint to create extra interest. Once I was happy with the result, I cut out an oval and slightly inked the edges with “Black Soot” Distress Ink to tone down the vibrancy. I also sparingly sprinkled some Shabby White “Frantage” embossing powder for added texture. I’m quite a big fan of using Oval Vine (Joy! Crafts 6002/0304) frame for my Halloween projects as when it’s cut out of black cardstock, all the curves and curls look somewhat spooky. In the middle of the frame, I glued the previously prepared inked background oval. The black edges of the oval almost blend in with the filigree frame, instead of really popping against it, creating an overall darkish look. In the centre, using the 3D foam pads, I adhered the fussy cut witch image. Finally, the whole focal point piece was attached to the card using the same dimensional foam for even more elevation. I love using flowers for embellishing my cards, and just because this project is a spooky Halloween one, does not mean that floral touches have be omitted. I chose a variety of flowers in differing sizes and shades, which complemented the colour scheme of the project. I also added a purple frosted berry, some plum-coloured stamens and a crystal spray for extra interest. The leaves I used to make my floral arrangement look more complete were cut out of green American Crafts cardstock, using Spellbinders “Create a Rose” (S2-067) and “Create a Daisy” (S2-062) dies. As I already used some ribbon on one of the layers, the project just called for a bow. A double looped one, as usual for me. I also adhered a really fun witch’s shoe button by Dress It Up to the centre of the bow for even more fun! 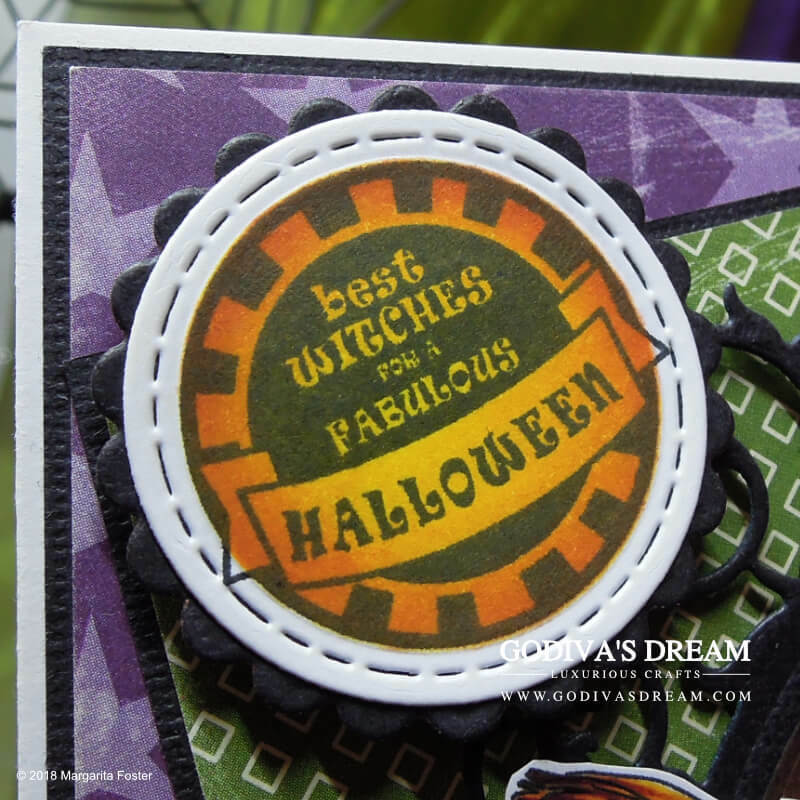 I recently purchased a set of circular Halloween sentiment stamps (“Halloween Trinkets” by Kraftin Kimmie Stamps) and thought that the phrase “Best witches for a fabulous Halloween” suited this card perfectly. I stamped it in Versafine “Onyx Black” ink and cut it out using a stitched circle die, then inked the sentiment using Distress Inks in “Mustard Seed”, “Spiced Marmalade” and “Rusty Hinge”. I glued this circle to the black scalloped one (Spellbinders S4-124) and adhered it to the card using dimensional foam. To fully finish off my witchy card, I used some orange and green glitter enamel dots as well as a couple of slightly glittery bats (La-La Land Crafts “Eerie Bats” die). Et voila! 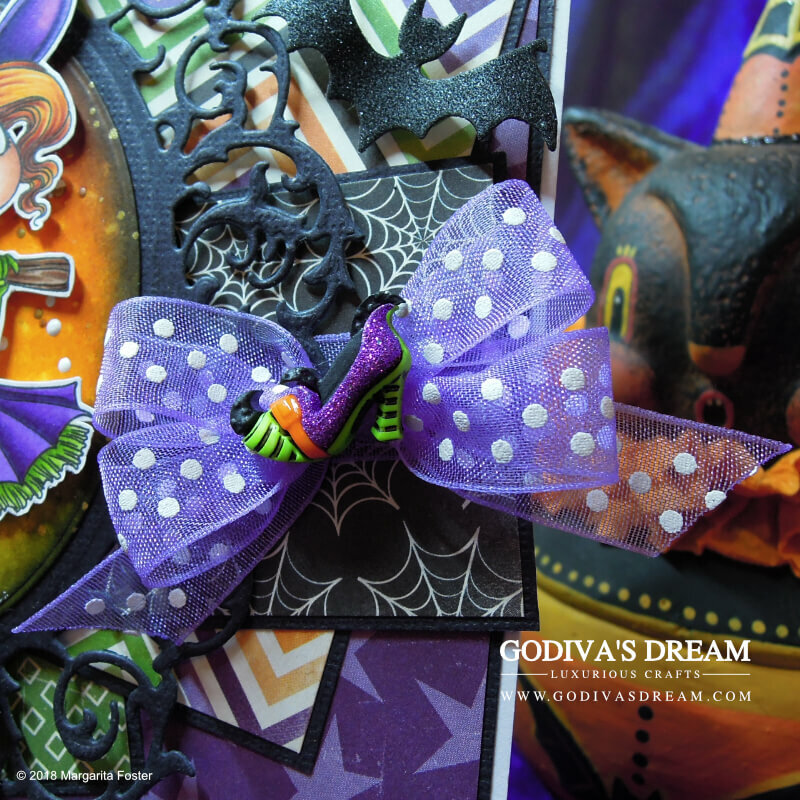 Have you ever created a witchy Halloween card? What colour scheme and stamps did you use? Let me know in the comments, I love reading them!